Yes, you read correctly. August (and September) “waiver trades” are now history. Simply put, teams must make final assessments a month sooner whether they are realistic contenders and then make decisions about bolstering their roster or becoming sellers. Let’s look at some examples. Contending teams often have injured key regular or role players they expect to be back by late July or early August. In the past, they often put off until mid August the decision whether to rely on these players for the stretch run and playoffs. Now unless they have sufficient in house depth, they must make their personnel moves prior to August first. Borderline contending teams must decide well ahead of July 31 whether they are buyers, sellers or will simply stand pat. Teams must fully fill in and set their depth chart prior to August 1 since it will no longer be possible to obtain outside help if a player goes down to injury after July 31. Role players or emergency injury replacement players previously acquired in August cost the acquiring team 5-6 weeks of salary. Now such players are going to cost 2 full months of salary. We do not know how this will impact performance evaluation and leveling of cost versus talent returned. Will the changes favor buyers or sellers? Only time will tell. How Might The End of Waiver Trades Impact The Reds? The first 5 players are players 2 through 6 among the highest paid Reds this year (Joey Votto is #1; $25M). The combined salaries of the 7 free agents, $65.375M, represents just over 50% of Cot’s projected Reds 2019 opening day payroll. The answer is clearly, yes, the change in the trade deadline rules may have a significant impact on the Reds. Let’s look at some specific cases involving the Reds free agents and the trade deadline change. Is it too far out on a limb to think that of the 7 free agents, the Reds possibly are only seriously interested in retaining Puig and perhaps Alex Wood? I think not. Yasiel Puig’s value depends on him returning to the level of play he displayed earlier in his career (13.8 fWAR in 2013-2017); but, the Reds will be patient with him, especially as long as the Puig factor plays well with fans. As the axiom reads, a team can never have too much left handed pitching, especially among starters. Alex Wood fits here; but, he needs to get healthy and perform effectively to demonstrate he can maintain on both accounts. Of course ironically, if he is hurt, he also has diminished or no trade value. Thus one way or another, as long as his injury doesn’t turn out to be a long term chronic situation, I believe the Reds will try to hang onto Wood. Let’s count these 2 out for now as trade candidates. Speaking of injury brings us to Scooter Gennett. Last season saw a soap opera about whether Gennet and the Reds were negotiating a long term deal. Gennett has already publicly expressed discontent this spring about the lack of progress toward an extension. Signs are that nothing is cooking here, especially with Derek Dietrich looking like Scooter V.2 for $2M this year and under team control (4th yr. arbitration) for 2020. Gennett’s injury could be the Reds situation most impacted by the change to the rules. He is projected to be out 8-12 weeks from opening day. That’s late May at the earliest and pushing towards July on the long end. Noticeably, the Reds did not put Gennett on the 60 day IL. I believe this is because they want him back on the field absolutely as soon as possible to build a trade value. Matt Kemp has supposedly been on the trading block since the day he joined the Reds. Kemp will make $21.675M this season which works out to $3.625M a month. His cost along with the fact other teams know the Dodgers passed $7M along to Reds toward his salary (and want their share if they take him) are probably strong reasons why he is still a Red. With new system, the Reds are going to be trying to convince someone to take 2 full months of Kemp’s salary versus 5 to 6 weeks if he were a mid to late August add on. Even if Kemp is playing well, this looks like a tough sell unless a contending team is beset by serious outfield injuries. But the Reds will try their best. I’m agnostic about the remaining guys. If the Reds are hanging towards the edge of contention, they will probably hold onto Tanner Roark and David Hernandez. However unless the team is absolutely in the thick of things, it should be just as easy to let them go on July 31 as it would have been then or later in the prior system. If these two are pitching decently, the issue is team performance, not individual money. They are classic deadline movers. And Zach Duke? A team can never have too many lefties; but 2 others in the pen and Cody Reed at AAA should be inducement to move Duke whenever the chance arises. A final caveat. If the Reds continue to slum along around a .400 winning percent come June 1, all bets are off. Any of of the upcoming free agents could go along with many other players. Otherwise, come August 1, remind me how well I’ve done. Puig is the definition of an enigma. From what I can read out of LA, he was generally adored by the fan base and although his teammates and Dodger management appear to like the guy he is regarded as a man-child beyond discipline. The upside is hard to even imagine, the downside equally so. He favors a poor man’s Ricky Henderson – marches to his own drummer but is exceedingly talented when compared to his peers. Like Ricky, it’s hard to take your eyes of YP. 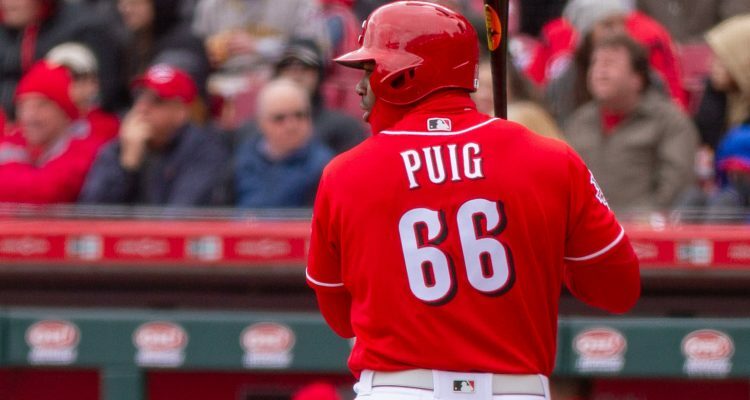 If Puig is crushing the ball come mid-July, what do the Reds do? I don’t believe they will be willing/able to pay the going rate for him and his trade value will skyrocket. I hope it will be a dilemma they have to deal with. The only quibble would be assigning any real trade value to Tanner Roark and David Hernandez…both are old by MLB standards. If the Reds were in the playoff hunt, and got either of those at the trade deadline, would RLN applaud the front office, for landing “the guy” to get them into October? Feels unlikely. Agree unlikely; but look at how the Brewers cobbled together a patchwork staff last season. A guy like Roark who can keep his team in a game for 5 innings can be a godsend to a contender with a deep pen but short rotation. Hold on Sliotar, that sounds strange. We have seen many a team in need of SP depth trade for below average, innings filler, starters at the deadline. Roark is more or less an average, SP3/SP4 pitcher, so he is a step up from that… with a pinch of upside with the right tweak by new pitching coach. He absolutely has trade value. He won’t bring back a top 5 prospect or anything, but a high ceiling A-ball prospect that is another teams fringe top-8 is certainly possible. No trade value is only a VERY select few SPs around the league…either injury prone or just awful, year in and year out. All these Reds listed have trade value, of varying levels. Now, if by no trade value, you simple no “big trade” or “trades I care about” value, that might be more fair, but there will be at least one contender (likely more) that is hovering around .500, but seeing constant SP4 and SP5 blow ups holding them back, that will see Roark as a big get for their purposes. Applaud is strong, and not likely, but if we’re running out 3 above average starters and blow-up machines at SP4 and SP5, absolutely RLN and others would give it a win trade grade…provided we didn’t send back a top 7 or 8 prospect or course. Maybe a prospect that looks solid but is a bit old for the league they’re in (say a 24 year old still in high A). Regardless of where the reds are, Kemp is expendable. Really want to see a Puig extension, a (if healthy and good) Wood extension, and a scooter extension. The Pitchers I think stay around if we are still in it. After a 4-5 stint and movement out of last place I am still hedging my bets to determine what the reds will do. As for the rule change itself. It was needed, It will cut down on obvious tanking scenerios which are the anti thesis of professional sports. I would be OK with a scooter extension if the NL is adopting the DH in 2020. Scooters defense is painful to watch on a daily basis and will only get worse. I believe the Reds have players to replace Gennett (Senzel), Kemp (Ervin or Trammell), and starters and relievers. Most of all, it is too early to worry about now. This is good stuff Jim, and I agree with the basic conclusions. But this is all predicated on an implicit “Reds = sellers” assumption that may or may not be valid. I’d love to see a similar post a bit further down the road assessing what a Reds as buyers scenario might look like – both for the insights themselves but also because it would mean the Reds are in contention. Well they have less than $60M in hard commitment on the books for next year. That’s a good starting point. I wanted to keep focus so I didn’t go there in this post. I think they feel like they have to move Scooter and/ or Kemp off the books to make a run at a serious rental or longer term add on at the deadline this season. And kiss at least a prorated portion of that $7M the Dodgers sent for Kemp goodbye if you really want to move him. It might not be such a bad idea to consider it a windfall and send it all along to sweeten a deal a couple of months into the season. That would cut the out of pocket cost of the buyer down to around $7M for 4 months of Kemp if my quick math is close. I guess you still can”t steal 1st base no matter how fast you are. Is there a realistic scenario where the Reds eat most, or all, of Kemp’s contract in a trade? If the team is paying that money either way would Ervin + the trade return be a better use of it? The Reds are 5-9 half way through April. Current projections by Fangraphs have them at 77-85. The next 27 games will determine a lot. A 7 game west coast trip to LA and SD. Then, an off day… then 20 games in 20 days including another West Coast road trip. All total 27 games in 28 days – 20 of which are on the road. And let’s see if they stand pat or make some moves throughout this stretch. What they do (or don’t) do could say a lot about how serious they are in trying to hang in this year. In turn that infers how quickly and completely they may move any or all the pending free agents. If Senzel is healthy by 1 May or even mid May and still at AAA, well, I guess we ‘ll know. I filed this away for future reference (https://www.latimes.com/sports/dodgers/la-sp-yasiel-puig-dodgers-legacy-reds-20190414-story.html), but this article by Jim seems like a good time to broach this subject. This text does not say that Puig is ignoring the positioning cards, but earlier in the article it stated that he did so while with the Dodgers. I am hoping for the best for Puig, but don’t be shocked if we hear at some point this year that he was out of position because he wasn’t following the positioning cues from management. Shocked? I’d advise to expect it. Puig is going to be a mixed bag, see my previous comment above. It sounds like nearly anyone who knows him genuinely likes him but he is stubborn. Extremely fan friendly, generous and soft hearted. I hope he reaches his potential during his time with the Reds and they are handling him with kid gloves. I’m always amazed at the disrespect Scooter gets on this site. No derek Dietrich is not Scooter 2.0. He’s a career .760 ops. People like to say things like, “well if you take away his home starts….” or “if you take out scooter’s month of May last year”. That’s how baseball works, you can’t just cherry pick stats you wish to use. There’s a reason Scooter is an all star and Dietrich isn’t, it’s simple. Scooter is a much better player. I listened to the podcast last week and Jason just threw out there that Scooter plays “far below average defense which makes him about as valuable as Jose Iglesias.” One simple look at the metrics can show that Scooter actually played above average second base last year. 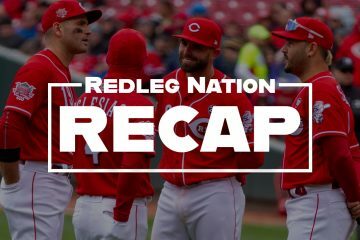 Also, I know we want peraza to be better because he’s under contract, or Iglesias and Dietrich because they’re new and cheap, or senzel or India because they’re prospects, but why don’t we just take a second to appreciate how great Scooter has been for us since he took over from a struggling peraza in 2017. He’s also the team’s favorite player, just listen to Jared Hughes speak on Jim day’s podcast about it. I believe with the amount of close games we’ve lost so far with a lack of offense, we’d be a lot closer to 9-5 than 5-9 with Scooter. Brian, I agree with your sentiments. Scooter was #46 in all of baseball in Fangraphs Total WAR in 2018 (4.5). That came on the heels of a season in which he hit 27 homers and drove in 97 runs in 2017. I agree that had he been in the lineup so far this year, he could have helped to counterbalance the team-wide offensive slump that has been evident so far. He’s not chopped liver. Agree 10000000%. Peraza is still in the threat of losing his position again. Derek Dietrich is a good pick up and should also be around on the reds, but RN needs to gete it through its head that the Peraza experiment has failed. Develop Dietrich as a Ben Zobrist lite, and Make scooter the long term 2B. I am tired of hearing of the fabled Early 30’s decline while watching yet another game where I see swing swing swing and am hoping that there is no mess up at the 2b defense. Oh and for the record, I would also take Jose I above Peraza. Matthew, I disagree on Peraza. He had the fourth-most hits in the NL last year, and the eye test tells me his defense has improved this year. I expect him to start to show his hitting ability sometime soon, just like the rest of the lineup. Seconded. He does seem to suffer from a lack of appreciation of some of the assembled but I think they are a small minority. You could do far worse than eight Scooter Gennets on your club. I meant no disrespect to Scooter either professionally or personally. My reference to Dietrich being Scooter V.2.0 was that he has also come from very humble origins to make a similar sort of impact. Who can say what offensive numbers Dietrich will produce playing his home games at GABP versus the huge field the Marlins play at. He is a career 110 OPS+ hitter and has been in that range the past 4 seasons, Gennett is a career 109 OPS+ bolstered by his 2017 /2018 123/125 OPS+ since he came to the Reds. However, it is not unreasonable to believe Dietrich might approach the numbers Gennett has put up the last 2 seasons. Dietrich aside, I believe the signs indicate the Reds are not that interested in signing Scooter to a long term deal and stand by that. I believe the Reds do not want to make a 4 to 5 year commitment to Scooter at the price it would require. On the other hand they could likely sign Dietrich for 2 more years for not much more than the average annual value of what Scooter’s next contract will be. Tom, I was at Opening Day and near the outfield. In the late innings, Lorenzen and Schebler were pulling cards out and looking and talking to each other and moving between batters. It was noticeable Puig in RF was not using the cards. Puig is closest to the dugout, the coaches were probably telling him where to play. Thanks Jim. Boy another mlb move that just kills the smaller market teams like the reds that are so dependent on trades vs free agency. just creates less time to negotiate and let things play out. And I agree, Scooter is really the only guy on the list worth keeping and even at that it would have to be a long term deal well below market value knowing that he will likely be a bench player with the arrivals of India and Senzel filling up infield spots. And the reason, I think they are looking to move Scooter is exactly the fact that he he figures to be a bench player at best within 2 -3 years and wants probably a 4 year deal with a 5th year option/ sizable buyout. The reason Dietrich could be the guy to fill that slot is he’s costing them $2M this year; and, is under team control for 2020. If the Reds would chose to, they can probably get Dietrich for 2 years for not much more than Scooter will make next season which besides being cheaper fits the team’s timeline. DB is loading up the lineup with RH hitters to face the big lefty. I really expected a RH slant to the lineup, but with Votto at 1B. I also expected to see Winker in CF with Schebler to the bench. I guess the CF expanse in Dodger Stadium won out with Schebler’s speed over Winker’s bat. I think that shows Bell has a very open mind! Casali has been hitting the best of all of those righty batters in the lineup, so why not let him lead off? He also saw that Votto is 5-for-25 against Kershaw with 13 strikeouts. If Votto was hitting well presently, he might be getting the start, but he hasn’t been. indeed, this lineup has the sole job of knocking CK out of the game. At that point the regulars can come in. Five former Dodgers starting tonight for Cincinnati. Platoon with five position players who were hitting under .200. Banking a lot on Castillo being at the top of his game. If good pitching beats good hitting most days, how does good pitching stack up against bad hitting? Rhetorical question. Jared Hughes has a team option for 2020 with just a $250K buyout. Jose Iglesias will be a FA after 2019 unless the Reds extend his contract. This places Hughes in the same category as Hernandez unless the reds want to pick up his 2020 option. I’m in the boat for extending Iglesias, if the two sides can reach a reasonable contract extension. Agreed. I think he’s a very valuable asset for a good team, which the Reds hope to be in the short term. Yep. I missed Jose Iglesias. He doesn’t seem to be on the Cot’s salary spreadsheets; but their individual player listings have him on a 1 year deal and over 6 years of service time. Agree he might be a guy to look at extending. Left Hughes out because it is a club option. Whoever hold his contract a season’s end controls him for 2020 if they choose. After last night, I’d think Raisel Iglesias will be available before the trade deadline. Have to think that the name Kimbrel is coming up in some of the front office discussions this morning. Iglesias has looked awful this year. I’d be in on experimenting by moving Robert Stephenson to close some games. Maybe even put Iglesias on the IL and bring up Romano. And now Raisel has three saves over his last three appearances striking out 9 in a row along the way. Does R. Iglesius have options? If so, Louisville is a better place to work out his problems than is the IL. Also, noted that Kershaw came out of extended ST and threw 7 innings. Reds starters came out of ST barely able to survive five innings. 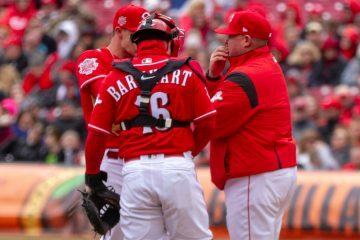 ST is not being effectively utilized to get ready; Reds are using the first month of the season, and its not working too well. Bell did not get the team ready in ST. The last week or so he was playing guys that will never sniff MLB games. This cat has a lot to learn and so far he is failing miserably.